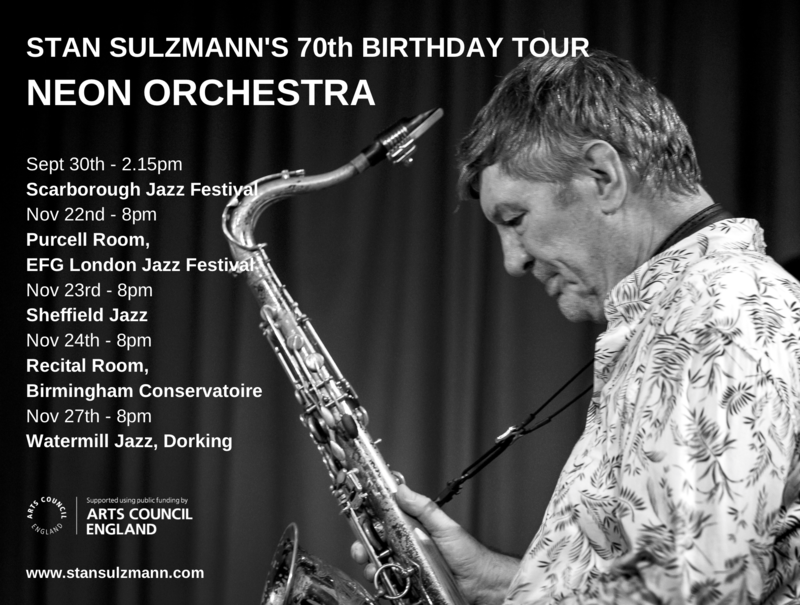 I’m delighted to announce that I will be celebrating my 70th birthday this year with a series of concerts with Neon Orchestra kindly supported by Arts Council England. There will be new music specially composed for the concerts and new arrangements of some old favourites. 1st Leeds College of Music (afternoon perf.) Guest with Miriam Ast vocal and Victor Gutierrez pno. Workshop/concert. 12th WATERMILL JAZZ, Betworth Golf Club Dorking Surrey. Guest with US musicians Marc Copland Trio (pno) , Drew Gress bass, Joey Barron drs. Marc is a long standing friend and colleague – – ( cd The Jigsaw on Basho with Bill Stewart and Larry Grenadier ). 26th Guest with Nikki Iles/ Karen Sharpe Quartet , The Meeting House, Ilminster http://www.themeetinghouse.org.uk/music/1949 8.00pm. 30th All That Jazz Fest, Naturist Foundation , Brocken Hurst, North Kent Guest with Miriam Ast/ Victor Gutierez Duo . 2 X 50 mn Sets, 4.30pm and 7.45pm. 22/23/24 MehrClef Summer School University Of Chichester. 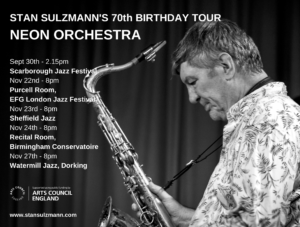 17 STAN SULZMANN / NIKKI ILES DUO Cambridge Jazz festival 2019 (10.30am /1.30 Workshop.) 3.00/5.00 Duo Concert CUC Wine Bar Cambridge.